When I was a teenager I aspired to become a famous poet. One whose presence would be in demand at nationwide book signings and glamorous cocktail parties with celebrity poets like Leonard Cohen and Margaret Atwood. Never mind that I was deathly afraid of reciting my poetry or that my fear of rejection prevented me from submitting poems to contests or literary publications. Somehow, I would be discovered – probably in a smoky bar. He would be tall, dark and chiseled – and he would be a literary agent. My delusional adolescent haze lifted during first year university. (What a drag!) Who in the hell makes a living writing poetry? Famous poets are dead. Or tortured. I’d probably have to drink a 40 ouncer every night to summon the muse; my liver was already pickled enough without having to add that to the mix. I put away my scribblers and went on to chase different dreams. But not everyone abandons poetry. Some people go on to make a living at it. Like Silvi Alcivar. 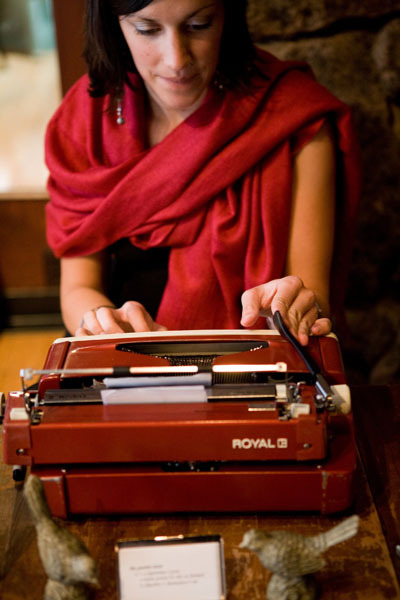 Silvi, who owns The Poetry Store, writes poetry on demand. You can even hire her for your wedding. This couple did. 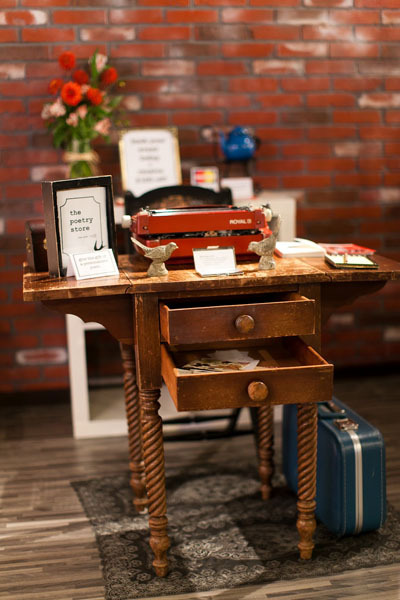 I interviewed Silvi, who lives in California, about The Poetry Store Wedding Booth. Perhaps it will inspire you to nix the photo booth, and hire a poet instead. And for all of you poets and writers out there struggling to make a living – maybe it’s time to think outside the scribbler – and inside the booth! Tell me how the process works. Guests find me at my charming vintage desk and typewriter, they choose a piece of paper that matches the wedding’s themes and colors, then I ask them a couple of questions. In 3 minutes or less, I give your guest a completely original, typed-on-the-spot poem! Yep, in about the same time it takes a group of people to squeeze into a photo booth, take some pictures, and have the photos printed, I compose a unique keepsake made especially for your guest. Because I try to make guests feel like they don’t have to rush or wait in line to get a poem, I’ve found it best to set up The Poetry Store Wedding Booth beginning with cocktail hour and continuing through dinner and then dancing. Of course, every wedding’s different, but I generally set-up for 4-5 hours, making sure I can write as many poems as possible while I’m there. In general, there’s a sort of unspoken rule of one poem per guest, but it really depends on the wedding. I’ve written poems at weddings as big as 1500 and as small as 47. On average I’m able to write 15-20 poems in an hour. People often get poems as a couple or as a group of friends, so that means that, in an hour, I’m often writing for more than 15 or 20 people. The goal, of course, is to make sure that everyone who wants a poem gets one, which is why I offer this guarantee: If any guest at the wedding does not get a poem, they can place an order with me, in the 2 weeks after the event, free of charge. How are the poems presented? All poems are presented in a hand stamped envelope. For an additional fee, you can give your guests poems in a bottle or in a frame. One of my favorite weddings used the frames first as each person’s seat marker and then as the frames for their poem. So fun! Are there other poets that you know of doing this? I’ve been writing on-demand poems at events of all kinds for the last 4 years. It’s been so much fun and such an honor to write thousands of poems for thousands of people. How is this received by guests? People love poems! When I ask, “Would you like a poem?” The response is almost always an enthusiastic, “Yes!” What I do delights and entertains people, giving them a personalized (and often very personal) experience they literally take away in their hands. Quite often one person in the room gets a poem and then they run around showing other people what just happened, encouraging other people to get a poem of their own. This often means friends and strangers alike are gushing to each other, striking up conversation that might not have happened. I don’t often have people who are shy, though some people need to be asked questions while others give me all the juicy details without my having to ask. My favorite part about writing poems at weddings is how grateful guests are toward the wedding couple for giving them such a unique, experiential, and memorable gift. Guests don’t just get poems, but something unexpected—“a poem? from a typewriter? for me?”—and they love it because it’s a gift that makes them feel loved. I am pretty busy, yes! And so grateful to be busy. I always encourage potential clients to book as soon as they know because my calendar fills up fast. In fact, I already have a few events booked for 2013! … Though weddings are my favorite events, I write poems at events of all kinds: birthdays, showers, corporate parties, art openings, you name it! Because I also make art and jewelry, it’s possible to have The Poetry Store at your wedding without actually having me on site! You can give the people in your wedding party poems in bottles, necklaces, or cuff links as gifts. I also make poetry art centerpieces and décor. Any thing I make, I’d be happy to incorporate into your special day.